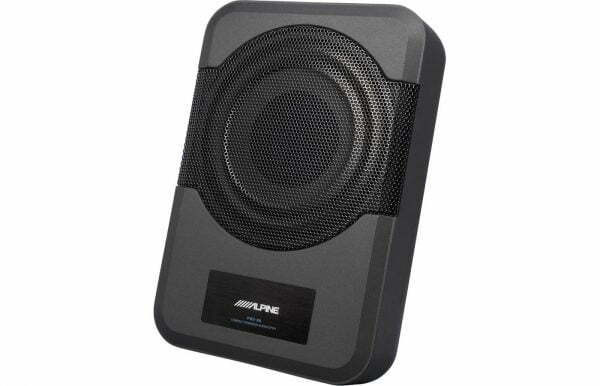 The Alpine PWE-S8 is a good use for space with a big subwoofer enclosure, but still want the thrill of Great bass? At only 3 inches deep, Alpine’s PWE-S8 powered subwoofer fits in all kinds of tight spaces: in the trunk of your car, behind the seat in your pickup, or even under the seat in some cars. And it’s made to stand up to life on the road, with its rugged cast metal enclosure that’s built to take the hard knocks of a tight installation while protecting your equipment. Alpines uses a Class D amplifier rated at 120 watts RMS to drive the PWE-S8’s 8″ shallow-mount, high-excursion subwoofer, so there’s plenty of power for your bass. The amp features controls for phase, gain, and a low-pass crossover, so you’ will be be able to match the bass up to the rest of your system. You’ll also find an input for a wired remote control that lets you dial in your sound from the driver’s seat. Easy-access RCA line-level inputs and speaker-level inputs with automatic turn-on make it easy to integrate this sub into almost any system. The PWE-S8 has everything you need to bring bass to places where there was never the room for boom.